Gutenberg, the new WordPress editor – blessing or curse? 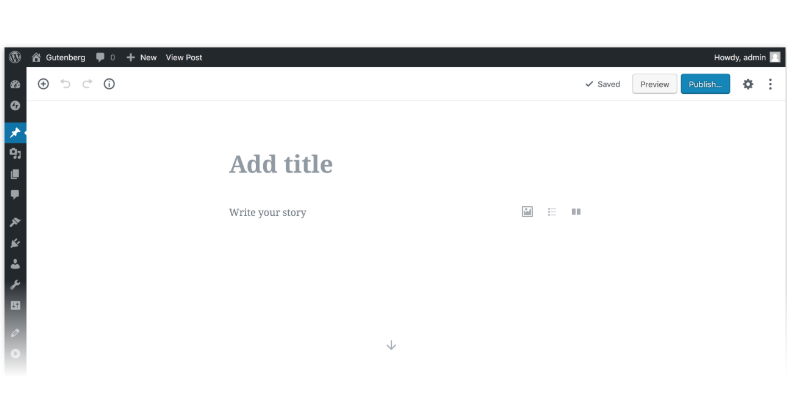 Although there is still a lot of controversy concerning Gutenberg, and with this content editor currently only available as a plugin (the default version will be included in WordPress 5.0), this software shows significant improvement when compared to its current counterpart. As its name suggests, the Classic Editor is just that – a classic. WordPress celebrates it’s the fifteenth birthday this year, and the classic text editor is only one year younger. For the digital age, this is practically prehistoric. Since then, WordPress has come a long way from being just a simple blogging tool; however, its default version and accompanying editor have been left far behind. Because the original software has remained static, newer WordPress functions come in the guise of add-ons and plugins to be attached as widgets and apps to the dashboard. The classic editor is not comfortable with inserting photo galleries, you can’t set up columns, and adding forms or other add-ins usually needs at least basic coding knowledge. Will I need Gutenberg if I use a page builder? For WordPress users who use page builder software, Gutenberg may seem like a step in the wrong direction. However, Gutenberg is not a page builder, but a content editor; it has little to do with creating templates for compete web pages, for which, by the way, you will still need a WordPress theme. A number of theme and page builder developers seem to like the idea of Gutenberg and have decided to aim to provide the best possible user experience which combines Gutenberg and the functionality of their page builder application. Some developers completely ignore the future of Gutenberg. This might eventually pose a problem for WordPress site owners who combine different types of application. Will Gutenberg work with my WordPress theme? In short, this completely depends on your chosen theme. The only way to find out is to test it. Never attempt this in a live environment, but make a copy of your website and go from there. Don’t know how? Ask your website developer to test your theme’s compatibility with Gutenberg for you. Gutenberg lacks when it comes to accessibility. Yes, it has many addons now built into its core, but recent technological developments such as speech recognition are nowhere near the standard of more specialist applications. There will still be many add-ons and widgets flashing on your Gutenberg dashboard, but these will be significantly less than those that decorate the classic dashboard. Getting used to new software can be frustrating, especially if you’ve been using one particular type for fourteen years. However, if you have had to shop around for various add-ons over the years, you might start to enjoy the increase in functionality. Like any new device, method, staff member or medication – you need time to get used to it. When it’s time, take the plunge. You never know, you might have the next fourteen years to get to grips with Gutenberg.